Repairman Jack has a chance encounter with a female spy known only as Chandler, and winds up working with her to prevent a deadly toxin from being unleashed on New York City. 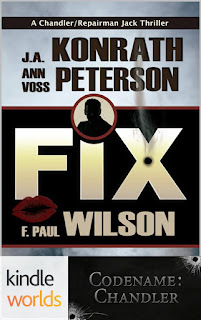 Wilson’s “fixer” Repairman Jack is already in the CU, and this crossover brings in the main character of Konrath and Peterson’s Codename: Chandler series. Through various crossovers, the inclusion of Chandler brings the following works into the CU: Konrath’s respective series featuring Harry McGlade, Phineas Troutt, and Jacqueline “Jack” Daniels, and his novel Disturb; Konrath’s Afraid, Endurance, Trapped, and Haunted House, all written as by Jack Kilborn; Peterson’s Val Ryker series; Blake Crouch’s Abandon, Famous, and Snowbound, the Andrew Z. Thomas series, and the Letty Dobesh series; Garth Perry’s A.J. Rakowski stories; Henry Perez’s Alex Chapa novels; Jeff Strand’s Andrew Mayhem series; Tom Schreck’s Duffy Dombrowski Mysteries; Bernard Schaffer’s Superbia trilogy; Tracy Sharp’s Leah Ryan series; Jude Hardin’s Nicholas Colt series and the spinoff Jack Reacher Files series, set in the same continuity as Lee Child’s Jack Reacher series; Iain Rob Wright’s Sarah Stone series; and Crouch, “Kilborn,” Strand and Wilson’s novel Draculas, which mentions The National Tattler, a fictional tabloid from Thomas Harris’ novel The Silence of the Lambs. The Clayton family seen in Schaffer’s Guns of Seneca 6 series is descended from Superbia’s Cole Clayton, while the hero of Konrath’s Timecaster series (written as “Joe Kimball”) is Jack Daniels and Phineas Troutt’s grandson, and a recurring villain in that series is descended from characters in Afraid and Haunted House. Both series take place in alternate futures to the CU.